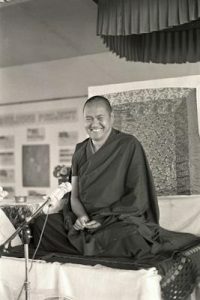 Lama Yeshe discusses the real meaning of Dharma and the nature of the mind in this discourse given at Chenrezig Institute, Eudlo, Australia, on September 8, 1979. Author TFTblogPublished on June 7, 2017 October 17, 2017 Leave a comment on What is Dharma? Lama Yeshe discusses the real meaning of Dharma and the nature of the mind in this discourse given at Chenrezig Institute, Eudlo, Australia, on September 8, 1979. Edited by Nicholas Ribush. Now, supposedly all of you should be Dharma practitioners, including myself. But the question is to know what Dharma really is. Generally, the word Dharma has many meanings, many different connotations. We have philosophical explanations but we don't need to get involved in those. Practically, now, what we are involved in is practicing Dharma. First of all, it is very difficult to understand what Dharma really means individually, for each of us. The reason is that, to some extent, we have to understand the relationship between Dharma and our mind or consciousness. So, in order to understand that, we should understand that the mind or consciousness has two characteristics. I am sure you have heard the philosophy of relative nature or character and absolute nature or character. And the relative character of the mind or consciousness is—and I am sure people who learned the mental factors from Geshe-la have some understanding, and for them this is easy—but, however, we explain that the relative characteristic of mind or psyche or consciousness is clarity and perception; the clear energy which has the ability to perceive reality, to allow the reflection of reality of all existence. That is what we call the mind. I want you to understand that our mind or consciousness is the clarity and clear perception which can take the reflection of the reality of existence, that is all. If you understand it in that way, the advantage is that when we talk about buddha potentiality then you can say, "Sure, we have buddha potential and we can reach the same level as the Buddha." We understand the relationship between the Buddha and ourselves. Otherwise, most of the time, sentient beings, including Australians, have the tendency or dualistic attitude to think, "I am completely dirty and unclean, totally deluded and hopeless, and sinful, negative, wrong, worthless." Whether we are believers or non-believers, we human beings always have the tendency to identify ourselves in such a negative way; in other words limited, like a passport identity. Our ego gives each of us such a limited identity. The fact that we believe we are such narrow limited energy already begins to suffocate us. We are suffocating because we have a suffocating attitude. You cannot make me limited; you cannot make me suffocate. My suffocation comes from my own limited neurotic thought. Do you think you can? You see, for that reason, each of us is responsible. I am responsible for my confusion; I am responsible for my happiness or liberation or whatever I think are good things. I am responsible. The Australian animal, the kangaroo, cannot make me satisfied. Then maybe the question comes that if the mind is clean clear perception, why do we become confused, mixed up? And why do we become neurotic? Because our way of thinking is wrong, and we do not comprehend our own view of perception. So the perception of consciousness is here on your side, and reality is there on the other side, and the view is somewhere between the reality and the consciousness—the perception view is somewhere between here. You see, we are too extreme. We are too obsessed with the object and grasp it in such a tight way, the conception is so tight. That is what we call confusion, not the perception itself; perception itself has the clarity to perceive garbage also. Its good side, its natural clarity, perceives the garbage view, but we don't look at that clarity perception, we can't see it. What we see is only unclear. So we do not even touch the relative nature or characteristic of the mind. Forget about the absolute! Thinking that human beings are hopeless is wrong. My thinking that I am hopeless, always with problems is not true. From the Buddhist point of view that is not true. Thinking that my consciousness, my mind is absolutely hopeless is wrong. It is making a limitation which has nothing to do with my own reality. Somehow, we think that we are clever. We think we are clever, but the true fact is that we make ourselves confused, we make ourselves dull by grasping at the hallucinated wrong view. That could also be Dharma, the philosophy of Dharma, the doctrine of Dharma. Let's say I ask each of you the question, what does Dharma mean, what are you doing, practicing. If I ask, for sure, if you answer what you feel in a really open way, all of you will answer differently. I bet you. That shows; actually, that shows. That signifies that each of you has a different view of what is Dharma and what isn't Dharma. Even just Dharma philosophy itself makes confusion, makes some kind of thinking, trying to say what is Dharma, what isn't Dharma: "This is not Dharma, this is not Dharma, this way yes, this way yes, this way is Dharma, you should not put this way because my Lama says or Buddha says." Before you contacted Dharma you were already so complicated, now when you take Dharma you become more complicated. Of course, first, in the beginning you see good, fascinating, "Dharma, wow." It is kind of new, a new adventure, a new discovery in this Australian kangaroo land. But in fact, if you don't understand the relationship between your own mind and Dharma, Dharma also becomes the source of confusion. We do know, I have experienced with my students that many times they come crying, crying. Each place I go to—I am a tourist—they have the fantasy, the idea, "OK, Lama Yeshe's coming, now I will tell him all my problems," or "Oh, oh, I am so happy to see you," and they cry, cry, cry, cry. "I broke this, this makes me upset. I told you when I met you a couple of years ago that I will be a good meditator and now I am not meditating therefore I am completely upset." You see—what good is Dharma? Their meeting Dharma becomes the source of guilt and confusion, so what good is Dharma? I would like to know, what good is Dharma? Is that worthwhile or not worthwhile? Actually, in truth, the Buddhist teaching is very simple, very simple. Mostly emphasized is knowing these two levels of truth of your own consciousness, and then making it more clear. Making it more clear sounds like it was first totally dirty. It is not necessary to think that way. Also it is not necessary to think that at first it was perfect. What we should understand clean clear is that our conceptualization, which daily interprets things as good or bad, is exaggerating and neurotic, and with it we build up a fantasy, some kind of house. This means we are never in touch with any reality—inner or outer—nor leave it as it is. Good example, when you grow in Western society—we bring the child into life, into the world—when you are like fifteen or between fifteen and twenty, or twenty-five or thirty or something in that area, confusion starts; more confusion, more neurosis. I want you to understand why. You check it out. The Buddhist teachings show you what life is, your lifestyle. You check out each age, how you were confused; you check out for what reason you were confused. It was because you had the fantasy attitude of grasping a certain reality. You think that is real reality, solid, you have some kind of notion of indestructibility. You think, you believe that way, which is unrealistic. Especially check out your up and down. Each day, how many times are you up and down, each day how many times do you say good or bad? It is like you believe that you can bring a piece of ice to Queensland, here, and sit on it saying, "Now I want to stay here for a whole year." How can you stay there? The temperature is too high, so the ice is going to melt. But still you believe, you hang on as if that can happen. Such a polluted ambition. That's the same thing that we have. I definitely say that Western life, the confused Western life, is unbelievably up and down, up and down; more than primitive country life like in Nepal and India. You can see why this up and down disturbs all your life, makes you unstable. Why? Because you hang on to the unrealistic idea that you hold in such a concrete way. There is no way you can hold, no way you can hold. It's the same thing with relationships that human beings have with each other in the West. A good example, human relationships with each other. It is also like the fantasy with the ice. You put such a piece of ice here and say, "This is fantastic, I want it permanently." But the nature of ice is to melt, so disappointment is certain. That is why there is one time disappointment, broken heart, two times disappointment, broken heart. You know what broken heart means? I am not sure what broken heart means; I need an interpreter! Broken heart, broken heart, shaking your heart, crying. Each time you cry, cry, down, down, dissatisfaction each time. So you make it, build up, build up disappointment. And each time your heart is broken you get more insecure, more insecure, more insecure. That is the source of the confusion. And also we do not rely on each other. Each time you break with human beings, "He did this, she did this," you distrust this, you distrust that, you distrust this. Then you distrust everything. Perhaps you people think, "Primitive country people hang on and have some satisfaction, but we change, we often change, so we become advanced." That is not true. That is garbage thinking. I am not saying only the relative point of view; the point is that in your mind, first you think that it is concrete, it is lasting, you determine that, and the next second it disappears. That one, that is the point of suffering. I am not saying you do this, this is wrong, this side. But the conception, always thinking this way, this way, this way; that is painful, that is really painful. That has nothing to do with advanced modern ways of thinking. That makes you more split rather than the complete modern man. Now, the point is that, remember, the human consciousness, the human mind has a relative nature which is clean, clear energy and has the ability to reflect all existence. Therefore, if we contemplate on our own relative characteristic or consciousness, which is the clean clear energy, it automatically eliminates the concepts which make us irritated, trouble us. So, we say the human being is profound. I am sure that Lama Zopa explained the precious human rebirth. The reason it is precious is because it has profound potential, profound quality. Even you can say pure quality, pure quality. The sense of this is that the relative character of the human consciousness is not totally mixed up with negativity or sin. That's all I am saying, that relatively thinking that the human being is negative and sinful is wrong. My point is, that any time, no matter how much you are confused or fearful or in a suffering situation, if you look into the clarity of your consciousness, your mind—it is always there, always there. This is the human beauty: the human being has the ability, the human consciousness has the ability to perceive things—good or bad, whatever it is—and also to use the wisdom which discriminates what is worthwhile and what is not worthwhile. Good or bad, impure or pure, we can discriminate—that is the human beauty. Don't think that human beings are hopeless; that's not true. You are not a good meditator therefore, "I am hopeless," that is also wrong. "I cannot sit like this for one hour, therefore I am not a meditator." Again, your limited judgment. We do. Who in Buddhism said that you can only sit this way to become enlightened, who said that? Where is that man? That's why the human beauty, human profundity, is always existent, always existent. Even though intellectually you make yourself too limited, it is always existent. You should not think, "Buddhism makes me good or bad. But now I have many things to count by, this is good or this is bad." As long as the relative mind is moving, concepts moving, day and night, twenty-four hours, the karma, or good-bad is existent. It is like, if I ask you Western people when we produced television, "Is television a fantastic vehicle?" When it first came out everybody said, "Wow, yes, fantastic." But now maybe some hippies say television is horrible, because there are too many garbage reflections. Similarly with our consciousness; it is kind of like a clean clear screen: it has the ability to reflect phenomena. So you look at this one. Here you have real television; your consciousness is television, so we should look at it, we should contemplate on that clarity, and penetrate. So in that way we can discover tranquility and peace. Also, that relative mind is an interdependent, composite gathering, interdependent gathering of energy; not one absolute thing. When we say, "I am deluded," you cannot blame this side, “The perception side is bad, I want to smash.” Also you cannot blame the object side, “That is bad, I want to smash.” Let's say, when you have some dirt on your face, you look in the mirror—"Wow! I am dirty, ugly. Oooh!" You cannot blame the mirror, nor can you blame your face, “I want to cut this off.” So what, what? The thing is that the gathering makes this phenomenon, isn't it? So the same thing, no matter how much we think "I am bad" or "I am terrible," the conception thinking these things, if you check it out it is a composite gathering. Many factors gather, and then we say that, "That is this, that, this." If you know all of these things, each part gathers to make the relative phenomena, you can understand that there is no concrete relative phenomenon inherently existent. Then you can see. All relative phenomena are superficial, impermanent, momentary, set up in such a way; then we say that, this, that, this, that, this, including ourselves. You see, actually, it has never occurred to our conception of ego, it has never dreamed, that the entire relative character of the I is composite energy, many parts of energy have gathered to become a bubble or some kind of cloud. As a matter of fact, our body is like a cloud—one bunch of clouds come, one bunch of energy comes—this is the body. Each day when you wash some part of the energy goes from the skin; each time you breathe some kind of energy goes out here with the breath. Then you eat and again some kind of energy goes inside. I think you know these kind of things better than I, maybe. Therefore, the ego mind, the conception of ego, has never understood this relative notion of what I am, who I am, this relative way of constructing reality. It seems sort of indestructible. "I am, therefore you cannot say I am bad. I am always good." Actually, when you say "I am good," you try to prove "I am good," that means you believe you are bad. I tell you, psychologically, inside you believe you are bad. Superficially you try to prove it by saying, "I am good, I am good, I am good." That's wrong—your mind is psychologically sick. You don't accept the relative truth. When you begin questioning that, the view and the concepts of your ego mind, then the possibility of opening, of understanding the absolute quality or characteristic of consciousness begins. If you just leave it, if you never question, in other words if you believe that your concepts and your concrete view are true, then there is no way for you to enter discovering the absolute quality of consciousness or mind. Especially, I think that Western scientific education has developed that a great deal—that the whole thing, myself and the whole thing, object, is some kind of concrete existence. That is wrong. I want you to understand that the Western scientific way of thinking, philosophy, has basically built up the concrete dualistic entity. I want you to understand that, instead of being proud. Education gives us the tendency to hang on to this basic way of existence, to hold the world as concrete: concrete Australia, concrete Australian beings. So, we suffocate easily. Maybe you freak out now. "Now this man is making a revolution for us! Wait a minute!" Previous article:What is the Mind?